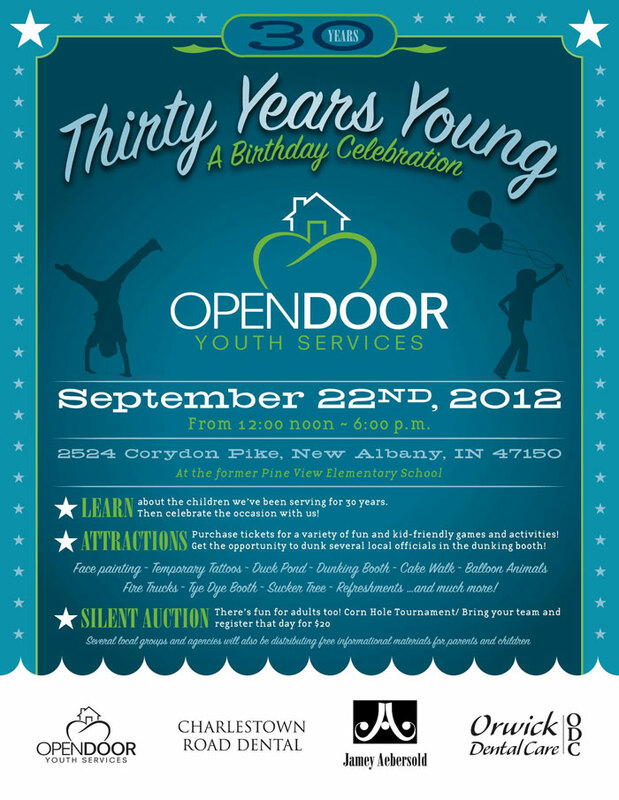 Open Door Youth Services will celebrate it’s 30th year of helping southern Indiana’s youth on September 22, 2012 from 12:00 noon – 6:00 pm. The celebration will take place at our new location where the former Pine View Elementary School was located at 2524 Corydon Pike, New Albany, IN 47150. Learn about the children we’ve been serving for 30 years, then celebrate the occasion with us! Purchase tickets from a variety of fun and kid-friendly games and activities! Get the opportunity to dunk several local officials in the dunking booth! Face Painting, Temporary Tattoos, Duck Pond, Dunking Booth, Cake Walk, Balloon Animals, Fire Trucks, Tye Dye Booth, Sucker Tree, Refreshments, and MUCH MORE! There’s fun for adults too! Corn Hole Tournament / Bring your team and register that day for $20.